July 11 is the 192nd day of the year(193rd in leap years) in the Gregorian calendar.There are 173 days remaining until the end of the year. 1906 – Murder of Grace Brown by Chester Gillette in the United States, inspiration for Theodore Dreiser's An American Tragedy . 1979 – America's first space station, Skylab , is destroyed as it re-enters the Earth's atmosphere over the Indian Ocean. Year 472 (CDLXXII) was a leap year starting on Saturday of the Julian calendar. At the time, it was known as the Year of the Consulship of Festus and Marcianus. The denomination 472 for this year has been used since the early medieval period, when the Anno Domini calendar era became the prevalent method in Europe for naming years. Anthemius was Western Roman Emperor from 467 to 472. Year 154 (CLIV) was a common year starting on Monday of the Julian calendar. At the time, it was known as the Year of the Consulship of Aurelius and Lateranus. The denomination 154 for this year has been used since the early medieval period, when the Anno Domini calendar era became the prevalent method in Europe for naming years. Bardaisan, known in Arabic as Ibn Daisan and in Latin as Bardesanes, was a Syriac or Parthian gnostic and founder of the Bardaisanites. A scientist, scholar, astrologer, philosopher and poet, Bardaisan was also renowned for his knowledge of India, on which he wrote a book, now lost. 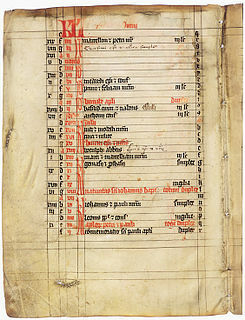 Year 1274 (MCCLXXIV) was a common year starting on Monday of the Julian calendar. Year 937 (CMXXXVII) was a common year starting on Sunday of the Julian calendar. Rudolph II, a member of the Elder House of Welf, was King of Burgundy from 912 until his death. He initially succeeded in Upper Burgundy and also ruled as King of Italy from 922 to 926. In 933 Rudolph acquired the Kingdom of Lower Burgundy (Provence) from King Hugh of Italy in exchange for the waiver of his claims to the Italian crown, thereby establishing the united Burgundian Kingdom of Arles. Year 969 (CMLXIX) was a common year starting on Friday of the Julian calendar. Pope Pius I is said to have been the Bishop of Rome from c. 140 to his death c. 154, according to the Annuario Pontificio. His dates are listed as 142 or 146 to 157 or 161, respectively. Saint Olga was a regent of Kievan Rus' for her son Svyatoslav from 945 until 960. She is known for her obliteration of the Drevlians, a tribe that had killed her husband Igor of Kiev. Even though it would be her grandson Vladimir that would convert the entire nation to Christianity, her efforts to spread Christianity through the Rus’ earned Olga veneration as a saint. While her birthdate is unknown, it could be as early as AD 890 and as late as 5 June 925. Saint Olga, who was the first Rus saint of the Orthodox Church, is the patron of widows and converts. December 6 is the 340th day of the year in the Gregorian calendar. There are 25 days remaining until the end of the year. September 3 is the 246th day of the year in the Gregorian calendar. There are 119 days remaining until the end of the year. ↑ G.W.S. Barrow (1965). Robert Bruce. University of California Press. pp. 37–. GGKEY:KAPF6W8J3A9. ↑ "National Institute of Culture and History -". National Institute of Culture and History. Archived from the original (PDF) on 10 March 2014. Retrieved 2019-01-02. ↑ Pandya, Haresh (2004-01-08). "Obituary: Tun Tun". The Guardian. ISSN 0261-3077 . Retrieved 2019-02-24. Wikimedia Commons has media related to July 11 .